Present day... A man returns to a long-abandoned neighborhood. Doors stand ajar, shutters hang open, lawns and landscaping are unkempt. The man sits on the curb and opens a leather-bound journal. Through the journal, he recalls the events that took place in Ravenhill decades earlier. Young Peter will set the tales down in his journal, which years later a grown Ben Foster will clasp as the last surviving corroboration of their adventures and of their astonishing discovery. What did you love best about Ravenhill Court? Ravenhill Court is a funky subdivision/cul-de-sac with mysteries. The story is set in teh 60's and winds around Ben, his sister Julie, and two friends who decide to see why all teh adults act so strangely. I loved everything about this book except that it was too short! I am reading it again as it's Halloween time. I loved all the characters, probably Ben the best. I also lived in a cul de sac in the 70's and can totally relate to the teenager curiosity and roaming around the neighborhood because there was nothing better to do. Karen Krause has a slow and melodious voice. It took a while for me to adjust to her voice, but thought she did a great job of bringing in a mysterious, spooky voice. I don't think this book would have been the same without her. I did listen to it all in one setting. Unfortunately, at 2 1/2 hours, it was too short. This is a great Halloween read! I knew it was a short story and hoped I would like it. Wasn't prepared for it to end though. I liked the twist, and I can often anticipate plots and themes and this one got me, I love that. The narrator did a great job portraying kids, I could easily believe the annoyance and petulance of Julie. I hope there are more Ravenhill Court. This was an interesting read. I was not expecting the story to go where it did. I won't spoil anything, but lets just say there's a really big reveal. It's a bit mind boggling. The main characters are a group of kids. They have a really cool clubhouse in the middle of the woods behind their neighborhood. In this way it reminded me of Stephen King's IT or The Body. The kids are on to something strange going on in their neighborhood. They visit an old professor who doesn't let them in on the secret but asks for their help. They go on an adventure and by the end of the they book find out some pretty crazy things about their world. Alternate Universe or ... ? What made the experience of listening to Ravenhill Court the most enjoyable? This is a story that turns the clichéd "alternate universe" idiom on its head. I can't say more without giving the plot away. But deep existential issues are raised. What other book might you compare Ravenhill Court to and why? I'm reminded of A Wrinkle In Time. Karen does an excellent job of distinguishing characters' speeches by using different voicings. The book is "listenable" in sections or all at once. 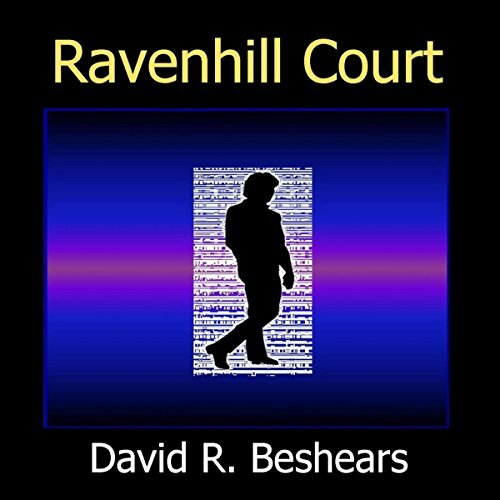 Would you listen to Ravenhill Court again? Why? Yes I will listen to Ravenhill Court again. I found it very enjoyable with likeable characters. This book is somewhat like The Twilight Zone or Outer Limits. I found it to be very entertaining. I enjoyed it from the start whenever Peter was going through the old journal. Then went on to recall how he and his friends went venturing out into the woods and discovered a secret portal with shadow people. The professor gave Julie a black bag with a crystal and told her to give it to Peter to take to the other side and that others would be looking for the gateway as well to try and stop them from entering. Then the adventure unfolds as he remembers it. Karen Krause has a great voice as a narrator. Good flow and distinctly different voices with the characters. The kids voices were great! Well, yes I had a little chill when he said the shadow reached out to touch him. That was a little scary. I would love to see this story continue. I wanted it to last longer. It's a great story for any age. Loved it and I received this audiobook free of charge in exchange for an unbiased review. I’m not a huge ‘epic fantasy’ fanatic, but the premise for this audiobook had me intrigued: who can resist a suburban 1960’s alternate universe story told from the teens and pre-teens who lived it? Not only would it be an interesting counterpoint displaying the world that “was” but the incorporation of alternate events and elements only witnessed by the children would make this unlike other stories I have read or heard about. Beshears has created a lovely story, laden with unexpected twists and unique elements, giving us four teens: Ben, Peter, Louis and Julie, and their quest to discover and unmask the strange happenings in their neighborhood. Initially the children are leaning to conspiracy – the adults MUST see what is happening, and they have decided to ‘ignore’ it all, or keep it hidden from them with the oft-heard refrain of “you are too young’. But then things turn on their side in a quite unique way, and the professor asking for their help gives them an entrée into all sorts of new and different perspectives. World-building, from the clubhouse to the neighborhood, and the kids’ experiences on their adventure give readers / listeners imagery that is accessible and easy to visualize, and it isn’t geared to just a younger reader. Adults and children alike can appreciate and understand the story, the plotting arc is smooth and flows from questions to adventure to recap smoothly as the characters come together to discuss what they know, don’t know and want to discover. Karen Krause is the narrator for this story: I’ve appreciated her work on other titles, and she did not disappoint in this one. Seamlessly navigating between the different voices that she gave to each character, with inflections, pitch and pacing varying slightly to give each character a unique and recognizable voice, her delivery of voices and the addition of emotive traits to emphasize emotions was spot on. The audio production was smooth and free from jarring transitions or noticeable editing. Audiobook provided for review by author.